Greece's shipowners consist a global power. They have one of the largest merchant navies globally and, due to very low labour-cost, they “build” and repair their ships in the shipyards of Asia and Northern Europe. Also, they enjoy numerous privileges by the law in Greece, including dozens cases of tax exemptions. 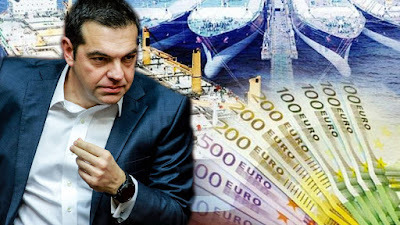 At the same time, the Greek governments - both the current one of SYRIZA as well as the previous ones under New Democracy and PASOK- have imposed a situation of tax-robbery against the working class and the popular strata. The working men and women, the pensioners, are called to pay enormous amounts of taxation, despite the huge cuts in salaries and pensions. Taking all these into account, the recent agreement between Prime Minister Alexis Tsipras and the Union of Greek Shipowners consists nothing but a provocative mockery against the people. According to reports, Greek shipowners will pay 75 million euros ($85.37 million) annually to the state budget, the prime minister’s office said on Wednesday, under a deal that replaces a previous voluntary arrangement. The sum is equivalent to a 10 percent levy on dividends, according to a statement by Prime Minister Alexis Tsipras’s office. The deal applies to Greek-flagged ships or freighters with foreign flags managed by Greek shipping companies. In front of their numerous privileges (including subsidies, tax-free oil, "black labour" without collective contracts and social security, etc) and their billion euros of profits, the amount of 75 million euros sounds like a bad joke. It must be noted that, a few days ago, during the procedure for the constitutional reform, the government of SYRIZA rejected a proposal by the Communist Party of Greece (KKE) for the abolition of article 107 which includes the policy of favourable treatment towards the shipping capital. Apparently, Mr Tsipras and his "left" government are building their so-called "progressive front" in collaboration with the capitalists.